• Find a primary location and one or two backup locations that need sculpture. One location might not be just right and it is good to have another location that would serve just as well. • Take pictures of where the sculpture is to go: both the primary and backup locations. What is the sculpture to do? 1. Evoke an emotion, mood, or feeling? 2. Symbolize a significant moment for you? 3. Be in the same style as other sculptures that you have seen? • Check several different sculptors websites or art galleries to see the kind of work they do. a. Make sure that the sculptor you choose has done several sculptures in the material that you are interested in - stone, welded steel, cast bronze, etc. b. 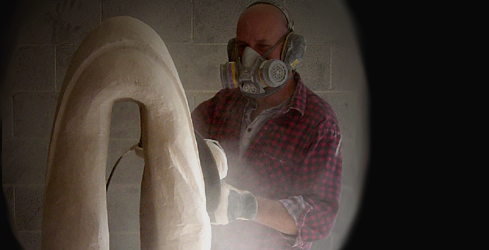 Regardless if you are interested in a sculpture based on a human or an abstract, make sure they have done more than one or two sculptures in a style that you like. to so that you can have a visual way to communicate with the artist. Bring along copies of these sculptures, to the sculptor/client meeting - see below, so that you can point to the sculptures that particularly speaks to you. • Based on the artist's price of other sculpture, determine the budget you want to spend on the sculpture. you. This can be done in-person or by email. sculpture(s) and estimates costs/charges and sends them to you. payment schedule and delivery time. placement at your location for approval. • Order Stone and begin sculpture. Send periodic photos if necessary.